What you eat after rolling out of bed has the power to give you all the energy that you need for starting the day full of vitality. Breakfast also provides what your brain needs to feel alert and what your muscles need to perform at their best. Granola is one of the best healthy choices you can have for breakfast. The components of granola will make you keep fuller for longer hours, so you will avoid eating the classic unhealthy snacks in between meals. 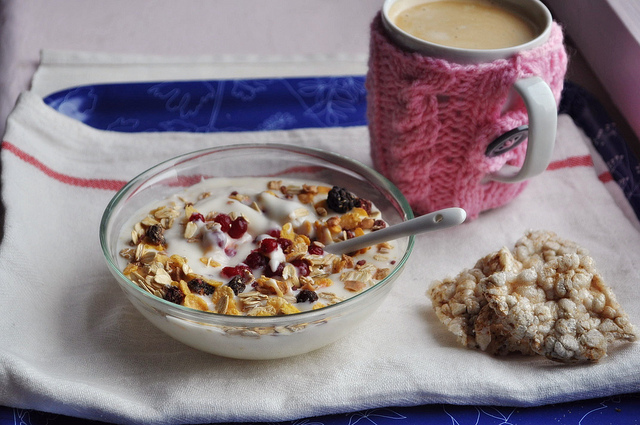 If the a.m. is your time for exercise, granola is definitely the perfect breakfast for you. The bursts of flavor together with the crunchy feeling are the perfect combination and make granola a very tentative meal. You can improve this by adding some yogurt to it. Here we comment on the welfares of yogurt and granola, which are not few! For many years, eating yogurt has been associated with good health. Yogurt is a great source of calcium and also protein. There are some fat-free, plain greek-style yogurts that provide about 13gr of protein per serving. Moreover, yogurt stimulates intestinal and vaginal health, improves lactose intolerance, shapes stronger bones, boosts immunity, reduces blood pressure and may even have anticancer and weight-loss effects. If you are following a losing weight diet, an adequate quantity of protein while losing weight can help your muscles stay healthy. Granola is full of heart healthy whole grains such as oats, wheat and whole wheat flour that can assist to lower your cholesterol. The entire grains in granola are also a good source of soluble and insoluble fiber, which help to keep your intestines in proper working order and also keep your body feeling fuller for longer periods of time. Many granolas also contain various nuts, which are very beneficial to your body. Nuts, such as walnuts and almonds, contain “good” fats and omega-3 fatty acids that are indispensable for heart health. One important aspect to consider when choosing a granola brand is to find the less caloric one since some of them contain lots of sugars. – As a snack. Granola can be eaten on its own as a crispy, sweetened snack food and as an energy-packed trail mix on the go. You can add extra dried fruit such as dry banana, raisins, apricots and apples to granola as well as nuts such as slivered almonds. Some types of store-bought granola already may have these healthy ingredients. Simply eat the granola as a healthy, filling snack to avoid munching on sugary snacks and empty calories between meals. – As a dessert: Spoon fresh fruit such as sliced peaches, raspberries or strawberries into a tall glass, then add a spoonful of yogurt and a spoonful of granola. Continue layering these ingredients until the glass is as full as desired. For a more decadent dessert, you can use vanilla or flavoured ice cream instead of yogurt.